It’s something coocking in Sweden. You’ve heard “Knugen Faller” before and here’s “The Vicious”. Has “Sara Almgren” who played keyboard in “T(i)NC”. Heard they’re in USA right now on a tour so here’s a little plug to check ’em out. 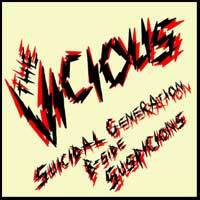 Vicious have an LP out too that I still haven’t heard. They also have a sweet 7″ out. ‘Obsessive’. the obsessive 7″ is super. i heard they have an lp comming out soon too. cant wait. i hope it´s as good as the obsessive 7″. I just got their ‘Igen’ 7″ and it’s awesome. Swedish sounds so funny. Of course I don’t understand a word. I have been so amazed by this band!!! Peter, check out the Masshysteri 7″ on Feral Ward. it just came out about a month ago. Sara on bass and Robert on guitar..amazing band! Yeah I saw them live a couple of weeks ago. They’re cool and it’s refreshing to hear a band that try something different but I’m sorry to say that they didn’t appeal to me that much. Same thing with the Vicious actually. yeah Peter. almost the same. the vocals are different although. i’m curious about their next thing..check out the new Social Circkle 7″ on No Way. it’s sooooo tight and catchy!!!!! almost everything the vicious did was really great.